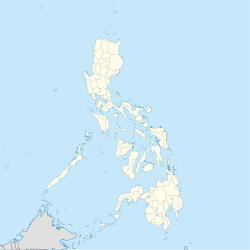 Baras, officially the Municipality of Baras, (Tagalog: Bayan ng Baras), is a 4th class municipality in the province of Rizal, Philippines. According to the 2015 census, it has a population of 69,300 people. In 1595, the Franciscan missionaries under the leadership of Fr. Juan de Placencia and Fr. Diego de Oropesa, founded a “visita” for Morong on the present site of Bosoboso, south of Painaan with Apostol Santiago as its patron saint. It was known as “Visita de Santiago” or Santiago until such time that it became Baras. Baras was then inhabited by 400 Aetas and other mountain people. In 1636, the town was transferred to a place called Ibayo, one and one-half leagues southeast of the first site due to the hostility of the Aetas and the mountaineers who burned part of the town and church in 1635. San Salvador became their patron saint. However, the town and church of Baras was burned by Chinese rebels in 1639, who were retreating from Manila to the Sierra Madre mountains. The ecclesiastical administration of Baras was given back by the Jesuits to the Franciscan in 1679. Two years later In 1682, the town was transferred to its present site where they would not be menaced by marauding tribes of the mountaineers. Baras was under the jurisdiction of the Province of Laguna from 1606 to 1853. Its administration was transferred to the newly created Distrito de las Monte de San Mateo in 1857. This district was changed to Distrito de Morong whose capital was in Antipolo but was later transferred to Morong. In July 1895, the representatives of Katipunan came to inform the people of Morong, Tanay, Antipolo, Baras and Pililla about the cause of the secret society. The Katipuan of Baras established the Real or Military Camp at sitio of Gogo or Pamitinan. On November 21, 1896, the Katipunan attempted to capture the town of Morong but were driven by the Guardia Civil. By 1898, Baras had joined the Revolutionary Government of Emilio Aguinaldo. After the defeat of the Spaniards in Morong, the Aguinaldo Headquarters ordered the establishment of the municipal township. A special election was held. However, the Revolutionary Government of Aguinaldo did not last because of the outbreak of the Filipino-American War. On March 29, 1900, Military Order No. 40, by Governor General Meritt came in effect. This order was for the election of an Alcalde Municipal, Vice Alcalde, and the Municipal Council. This was implemented in October of the same year. Act 942 was passed by the Philippine Commission in 1902, providing the establishment of the Province of Rizal to be comprised in part of towns from the former Distrito de Morong. Baras effectively became part of the new province. However, in 1903, it was relegated to be a barrio under the town of Morong. On January 16, 1906, Baras was annexed to Tanay as a barrio by Act No. 1442. But as Baras was not represented as a barrio of Tanay, and previously under Morong, there was a movement for the separation of Baras as an independent town. Under the leadership of Leopoldo Digma, the clamor was realized through Executive Order No. 57, dated November 24, 1920 establishing the Municipality of Baras. During the Second World War, the Imperial Japanese armed forces occupied and entered the municipal town of Baras in 1942. The local guerrillas of the General Marking Unit sieged and invaded the town of Baras and attacked the Japanese from 1942 to 1945. The local Filipino troops of the Philippine Commonwealth Army and the Philippine Constabulary units liberated the municipality of Baras in 1945. The guerrillas of the General Marking Units defeated the Japanese forces and it ended World War II. The Military General Headquarters and Camp Bases of the 53rd Infantry Division of the Philippine Commonwealth Army was established and active from January 3, 1942 to June 30, 1946 and built Camp Caparas in Baras. The military engagements of the Anti-Japanese Operations in Manila and Southern Luzon aided the local guerrilla resistance fighters and U.S. military forces against the Japanese Imperial forces. The town of Baras was razed to the ground on March 10, 1945. This signified the liberation of the town but also left many homeless. The rehabilitation of the town began. War damage claims were filed to the amount of P 300,000 to be used for the construction of new houses. Then mayor, Mariano Golla, focused on the improvement of roads and the construction of a public dispensary. Under his term, Baras was elevated to a fourth class municipality due to an increase in income. Under the succeeding administrations, improvements of road networks were implemented; seven liberty wells were constructed; the number of school houses were increased; river controls in Barangay San Juan and San Jose were constructed; rehabilitation of the existing government building continued; and a reforestation program was launched. In the 2015 census, the population of Baras, Rizal, was 69,300 people, with a density of 820 inhabitants per square kilometre or 2,100 inhabitants per square mile. The oldest and most notable landmark in Baras is the St. Joseph Church, built by the Franciscan missionaries in 1682, the same year the town was transferred to its present site. It was completed in 1686 and was dedicated to St. Joseph, the town's patron saint. It is known for having paniki in its ceiling. The Church has been seen in well-known international and local films, TV series and commercials. This breathtaking man-made falls in Palo Alto is just an hour drive from the town's population. Legend says two lovers who had family issues committed suicide to the falls so no one will be able to separate them. The Falls is now being managed by the Local Government Unit. Few minutes of hike will take you to the cold as ice falls of Kinamatayan. A conservation area adjacent to Garden Cottages located in the mountainous section of Baras by its border with Tanay, Rizal. The site of the 53rd Infantry Division of the Philippine Commonwealth Army, the military general headquarters, military camps and garrison was located at Camp Caparas in Concepcion, Baras, Rizal from January 3, 1942 to June 30, 1946. During the Battle for the Liberation of Manila on 1945, over 15,700 Filipino soldiers, tanks, armored fighting vehicles, military trucks, artilleries and many other equipments of the 53rd Infantry Division of the Philippine Commonwealth Army sent the military operations from Military GHQ at Camp Caparas in Baras, Rizal for the military operations in the City of Manila in February to March 1945. It was the site of the General Agustin Marking Guerrilla Unit which was founded in 1942 to 1945 at the guerrilla bases from the mountains in Baras, Rizal. Baras is also the home of the Philippines' native martial arts', Sikaran,This ancient martial arts was popular among the Farmers in the Village of Baras in the province of Rizal in the Philippines even before the Spanish Conquest of the Philippine Archipelago on March 16, 1521 when the Islands was discovered by Ferdinand Magellan. ^ "Province: Rizal". PSGC Interactive. Quezon City, Philippines: Philippine Statistics Authority. Retrieved 12 November 2016. ^ a b c d "History". Official Website of the Municipal Government of Baras, Rizal. Wikimedia Commons has media related to Baras, Rizal. This page was last edited on 24 February 2019, at 08:49 (UTC).